“What distinguishes us from our neighbors is that we denounce and condemn murderers in our midst and pursue them until the end, while they name public squares after child murderers”, said Israeli Prime Minister Netanyahu in August 2015, two days after the Dawabshe family in the West Bank town of Duma was torched by Jewish terrorists. He made the same claim a year earlier, after Muhammed Abu Khdeir, another young Palestinian, was burned to death in Jerusalem. I have already provided a long list of Israeli streets named after Jewish terrorists, but now Netanyahu’s contention is being challenged in the most unlikely of places — the grocery store. A freely distributed nylon grocery bag featuring a photo of Elor Azarya the medic-soldier who murdered the wounded and incapacitated Palestinian Abdel Fatth Al Sharif in Al-Khalil (Hebron) last March is being distributed at the Rami Levy supermarket chain, one of the major chains in Israel. The bag has a likeness of Azarya, who was recently convicted on the reduced charge of ‘manslaughter,’ smiling whilst holding a semi-automatic gun in ready-to-fire position. The text on the bag says “Bag is free. ELOR PAYS FOR US ALL. Happy birthday. Love from the nation of Israel” [which means ‘Jews’ – ed.]. “Every soldier who goes to the army is everyone’s son [‘everyone’s son’ has been an iconic slogan concerning Azarya, ed.] – for good and for bad, we are talking about a positive initiative from my standpoint, and I have no intention of disturbing it, and surely, surely I do not oppose these bags being distributed free at our chain”, he said. In a bizarre twist, an Israeli environmental organization has complained to the Ministry of Environmental Protection that the initiative violates a new law, against free distribution of bags (noted in Ynet, Hebrew, yesterday). The law requires a chain to take at least 10 agorot (cents) for a bag. The society notes that whilst it sees the political protest as legitimate, the free distribution violates the law. The Ministry of Environmental Protection wrote to Rami Levy with concern. Ynet ends the article with the note, that the Rami Levy chain responded: “The bags are not ours”. That’s it. The bullet just came out of Elor Azarya’s gun. It wasn’t Azarya’s bullet, it was the IDF’s bullet. Why does Azarya have to pay? The bags appeared at Rami Levy’s chain. He loves them. But what does he have to do with it? Move on. Just another little episode in the ‘only democracy in the middle-east’, with its ‘most moral army in the world’, a moral society that never glorifies its murderers. Well, someone has to pay for all those Zionists who are too busy “holding their noses” to don Captain Israel outfits and summarily execute wounded and incapacitated people. This is hardly surprising or new. Israel has always glorified it’s terrorists and murderers. No less than the Palestinians. I guess elor should be awarded the Lehi ribbon as befitting for such murderous criminals. I am a little surprised because Ofir is Israeli, and I presume he speaks Modern Israeli (fake) Hebrew. The last line is (I think) supposed to be a signature line from whoever printed up those bags. “(The) lovers of the people of Israel”. Of course, it is grammatically wrong because most of these brain-dead genocidal racists don’t have a clue about proper MIFH grammar. Because English speakers don’t know enough grammar in English to understand the issue, I added some Latin equivalents. There is a slight difference of nuance between the two possible correct signatures, but generally anyone believing E. Europeans have any legitimate claim to territory in the Levant is a moron or ignoramus and is unlikely to know correct grammar. YoniFalic, it says “ohavim am Israel”. Ohavim is a plural verb, as in “loving”, as in “loving you”. I don’t think we need to lose focus on the bigger issue at hand because of these semantics. ohev kesef = greedy (construct participial adjective. The signature line on the grocery bag betrays a very elementary error in Hebrew. I doubt even the most low-status native MIH speaker, who attended the worst public school would make it. The error tells us something about the people that printed that bag. They are probably non-natives that never mastered MIH and that harbor a lot of anger. I suspect American immigrants of rather low status. They are probably trying to prove they are more than what they are by means of extreme hatred of the natives. I am supposed to be an historian. I have to try to understand such people even as I disdain them and consider them symptoms of a very serious disease. “I am supposed to be an historian. ought to clear up your suspicions. Rami Levi Supermarkets disclaims any association with those that made the shopping bags. It is important to understand how the Zionist system works and where the thugs, who printed up those shopping bags, are situated within the Zionist political-economic-social system. There are Israeli and International Zionist plutocrats that are shoveling money into their pockets — mostly by stealing from Palestinians and by pick-pocketing Americans via US foreign aid and other subsidies. There is another comparable system of plundering the US and the international economic system that works by stealing Intellectual Property (IP), by pump-and-dump investment schemes, and by setting up US (but really Zionist/Israeli) defense corporation, where Israel can spend US foreign aid that must be spent in the USA defense industry. There is also a lot of evidence that Israel works to create a modern version of shtadlonim that can intervene in national political systems. My research group has looked at Adelson, Saban, and other hyperwealthy international Zionist plutocrats. It almost seems like a co-option system, whereby the plutocracy indirectly chooses other members to join the Zionist plutocracy. After the plutocracy takes its chunk, lower ranks (like my family) of the Jewish/Zionist estate system get to take their much smaller piece, right down to the thugs in Hebron, who do a lot better than they would without the Zionist estate system — at the very least they get their jollies by beating on Palestinians. The Medieval system could be justified somewhat amorally because such an exploitative system was necessary to extract and to build up the capital resources to do any sort of meaningful economic development. Nowadays, this highly exploitative is simply wrong and must be abolished. Amusing, but E European Jews are so good at self-indoctrination and mobilization that thuggery is as often as not autonomous and spontaneous. Proverbs 30:27 says it all. Locusts–they have no king, but they march in formation. “Yoni”, man, I love you, but at some point it might be better if you stopped talking like an Israeli. Doesn’t matter much if you put “E European Jews” or “Arabs” in that sentence. I’m not sure that English speakers who do not know the grammar of their own language will profit much from seeing the Latin. Well there it is , on a shopping bag for all to see.the image that embodies the mindset of the chosen citizens of the light unto the nations .We honour our heroes even if they are murderers and executioners. Hopefully , these bags are not recyclable and are destined for a dump just like project Zionism eventually is. Hazmat Warning , “Toxic material dumped here” .Zionism is hazardous to your health and can be life threatening.Steer clear. Israelis have an ugly habit of doing the exact thing they accuse the other side of. They are as guilty as those they point fingers at, but it is strange the media does not mention this. No, Israel is more guilty than those they accuse. Whether it is corruption, nuclear weapons, murder, terrorism ir any other deranged set of crimes. As noted they are masters of prkjection but are not limited to that. Those they point their fingers at are quiten often innocent while they ignore the log in their own eye. Whatever Israel was intended it is now a nation of terrorists, thugs and criminals. One can only hope that the silent decent and moral Israelis leave and disassociate thrmselves. If the history of the last half century of governments there are any measure there won’t be all that many leaving. Too busy enjoying the plunder and violence they inflict. Israel has become such a parasitic rogue nation, occupies, kills, maims, steals, and they have a good share of terrorists too, because of the enabling by the US, UK and other Western nations. The UK and the US pretend to condemn their actions occasionally, but they are all in this big con game. US Tax payers keep paying for those illegal settlements that have suddenly increased “bigly”, but still the oy veys keep being heard from every administration, and the aid and weapons to criminal land seem to get more. Jonathan, I notice that in your long list of streets named after Jewish terrorists, you fail to mention the most cruel terrorist of them all — David Raziel. Hundreds of Israeli streets and even a town, Ramat Raziel, are named after this terrorist who placed bombs in street markets killing more than one hundred Arab civilians. Thanks Hasbara Buster – point taken. Today, the Knesset honors the memory of Avraham Stern, “Yair”, fighter for the freedom of Israel, commander of the fighting underground, philosopher, poet and intellect, lover of his people and his country, zealous and passionate in his beliefs, desperately dedicated to his mission. The shortness of “Yair”’s life – the master of the plot – could serve as inspiration for a gifted scriptwriter or playwright. The writer Moshe Shamir, at the end of his life, wrote an impressive biographical novel about “Yair”. What is missing in the story of “Yair”’s life? Revolution, strong emotions, tensions and a combination of strong urges for the love of a beautiful, captivating woman and for total, pure loyalty to national liberation; command of a small group of fighters challenging a huge power; a life lived in darkness and underground, with a price on his head as a wanted criminal; and in between – enthusiastic and eloquent writing expressive poetry and liturgy, breath-taking in their power, sermons of sacrifice and martyrdom on the altar of freedom – fire and blood and pillars of smoke, words of contemplation and philosophy, classical studies and dreams and hallucinations about the thin line between the bold and the somnambulist. These are the materials from which larger than life characters are built, the greatest of dramas, fascinating novellas from which the reader’s eye does not stray from the first page until the final line. What was the secret of “Yair”’s power? Where did his ability to unify underground fighters with opposing, even polar outlooks – religious and strictly secular, radical left and messianic right and those with “Canaanite” tendencies: Natan Yellin-Moore, Israel Eldad and Yitzhak Shamir; Amos Keinan and Geula Cohen and others – come from? Avraham Stern was certainly not a great orator nor a leader that swept crowds off their feet. He was not even really a fighter who bore weapons. His influence spread in intimate groups, among enthusiastic young people who were fascinated by his maximalist, revolutionary, anti-imperialist and uncompromising teachings. His truth was as sharp as a razor, straight and blunt without any opaqueness or obtuseness. The goals he set were transcendent and optimistic and dedicated all means – blood, sword, sacrifice and death – to the idea: “redemption of the land – resurrection of the kingdom – renaissance of the nation”. There is another thing which always strikes me when I think of this unique and special man. His terrible loneliness, alone in a room – in his hiding place – alone with a small group of people, and with a fervent and unshakable belief that from that lonesome room, from that hiding place, would come forth a great change, one which would eventually lead to the redemption of the land and the people. Off what did he think? We will never know how he coped with the terrible loneliness, waiting for the merciless and cruel murderer to come. What did he hope for? What did he pray for? What did he long for? What was it he could not let go off? As we mark 100 years since his birth, and 65 years since his murder, “Yair” deserves that the State of Israel should remember and commemorate him as one of the designers of the spirit of freedom and heroism, without which our nation would not have been reborn. This does not mean that we must identify with all his teachings, because “Yair” paved a very independent path in the Zionist struggle. Whatever reservations there may be, “Yair”’s contribution to the freedom of Israel cannot be denied. The LEHI fighters who acted because of his inspiration made an important contribution, in belief and dedication, to the struggle for the rebirth and an end to the Mandate rule in the Land of Israel. “Yair” is counted as one of the family of fighters towards whom I have a profound personal sentiment, despite the fact that the paths diverged. “Yair”’s path was not the high road of the Zionist struggle, but it had dedicated and brave soldiers, those who were hanged from the gallows and courageous fighters who fell in battle. All who were educated as to his greatness and bravery, even the most bitter of “Yair”’s rivals, are respectfully beholden to his and their valor. “Yair” was that match which burned and kindled a large flame. May his memory be blessed. The assassin is a “medic”. This is another anomaly particular to Israel and its IOF that I cannot really comprehend. What medic anywhere does this??? In 1864, sixteen European states adopted the first-ever Geneva Convention to save lives and alleviate the suffering of wounded and sick persons in the battlefield. As well as to protect trained medical personnel as non-combatants, in the act of rendering aid. According to the Geneva Convention, knowingly firing at a medic wearing clear insignia is a war crime. It’s completely insane that this “medic” was the executioner and that other IOF’ers stood by as he murdered this Palestinian with malice and in cold blood~ leaving him to exsanguinate without any dignity nor care. 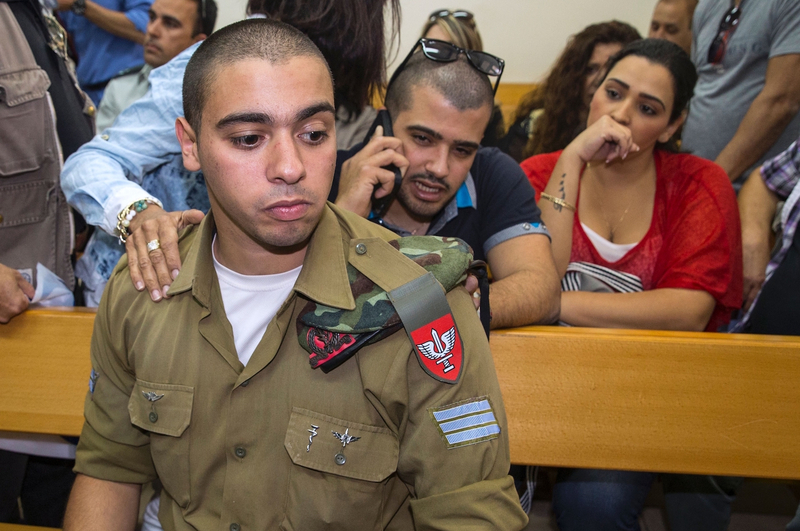 Elor Azaria wears an IOF uniform with the “snake around torch with Star of David on the bowl of the torch”. Disgusting. His image on the bag is only fitting to be used for garbage, but I guarantee you that some folks will collect and frame these “free” garbage bags. Idf medics are clearly combatants. It would be difficult to charge someone with a war crime if they were to intentionally shoot one. Not only do they behave as combatants but in both the political and public realm they are lauded for that behaviour. Apart from this intentional murder it is not just a one off as there is a lengthy list of incidents where aid was not given and people were allowed to bleed out. Israel is a rogue state that has lost any moral basis to rule over the people in the region. When I read “Elor Azarya the medic-soldier who murdered the wounded and incapacitated Palestinian Abdel Fatth Al Sharif”, I remembered the original article posted shortly after this ghastly public execution. It was a harrowing account and image for a number of reasons: this was a war crime; an act of murder, done to a wounded man, by a so-called “medic”, with a cowardly shot from the back and aimed to kill by firing at the head, soberly, unopposed and deliberately violating the Geneva Convention. How can Israelis condone this replay of street executions by the SS during WW2? I don’t even want to know how a hebrew dictionary defines “moral”. I don’t know how a Hebrew dictionary defines “moral”, but Zionists seem to think that it is “moral” for Jews to do unto others acts of injustice and immorality they would not have others do unto them. Thanks Just. Well, if you watch the recent documentary film ‘The Lab’ on Israel’s weapon industry, you’ll see General (res.) Amiram Levin saying “these people were born to die. We just need to help them to it”. It would appear Azarya was thus merely “helping” Al-Sharif, because, as Azarya himself said, he “had to die”. It’s interesting that Levin has more recently come out in defense of Breaking the Silence, against the accusations that they were ‘traitors’, attacks that also came from defense minister Yaalon. Seen in the light of Levin’s aforementioned statement, it would appear that he subscribes to the “shooting and crying” idea. But people like Azarya don’t need to “tell” about their deeds – everyone saw it. And that’s the problem. Israeli soldiers are apparently supposed to “help Palestinians die”, and be able to vent their disturbed feelings. But legal accpuntability is a whole other universe. We seem to apply it in diluted formula, when there seems to be no choice, when the PR price is just too heavy. MY COMMENT: Netanyahu is even more of a liar than is Donald Trump! I guess it’s a fascist thing. This mentality has been endemic in Israeli society for the longest time. Anyone who thinks change in Israel will come from the inside without any meaningful outside pressure is, in my opinion, mistaken. You like that kind of “branding”? American Jewish organizations snap to attention whenever an Israeli politician recites one of the four fabled code words “Iran,” “BDS,” “Palestinians” or “terror,” along with “anti-Semitism,” so long as it isn’t Trump’s. Seriously selective and unhinged memory these Zios and their supporters around the world viz the Yahoo`s recent rant about the Grand Mufti persuading Hitler ref the Final Solution and the storm of Semitic ” anguish” and ” despair” generated by Ken Livingstone stating historical facts about Zionist/Nazi links. Tom Suarez mentioned in his mind blowing book “Israel – State of Terror” that the Lehi assassins of Lord Moyne were remembered on Israeli stamps in the 80s. Hey, I was just quoting something I saw in a kid’s book. What a shameful sociopathic society you Israeli squatters are. The gutless coward is a murderer who shot dead an unconscious man INTENTIONALLY. Shame on you fools who label this and others like him heros. You read approximately right, only that they do that with the full cooperation of the US Pharma eye-gougers and their smooth-talking abject slave the FDA. Evil tongues have even tried to suggest that the US Gov is even more lenient with Zionist pharma than the US-headquartered multinationals. The EMA, new oversuperbureaucracy in Europe, is about as independent from the US as the Ramstein base. Before the passage of AIA (America Invents Act) there were some gaps in US patent law, and they made it possible legally to poach certain IP (Intellectual Property) specially in pharmaceuticals. Nowadays one does the same thing by directly trying to invalidate a patent in an Inter Partes Review. I have been studying this sort of lawyering because I intend to wage law-fare against Israel, Zionism, and Zionists. I was, in fact, referring to a much more sinister less transparent business practice. I’ve seen good evidence that the Israeli government at behest of Zionist business interests was using Comdex (at the time owned by Adelson & partners) to identify technologies to steal. As communications & computer networking moved into the commodity market, Comdex became less valuable to case the properties (so to speak), and Zio financiers arranged a massive pump-and-dump, which turned Adelson into a super-shtadlon, who could subvert US politics. Adelson’s current major investments seem extremely helpful in similar manipulation and subversion because casinos and hotels are tremendously useful in moving money around without traceability. We have found many signs of this sort of financial conspiracy right from the founding of the State of Israel while Jabotinsky and Achime’ir not infrequently discussed this sort of covert economic warfare back during the Mandatory Period.